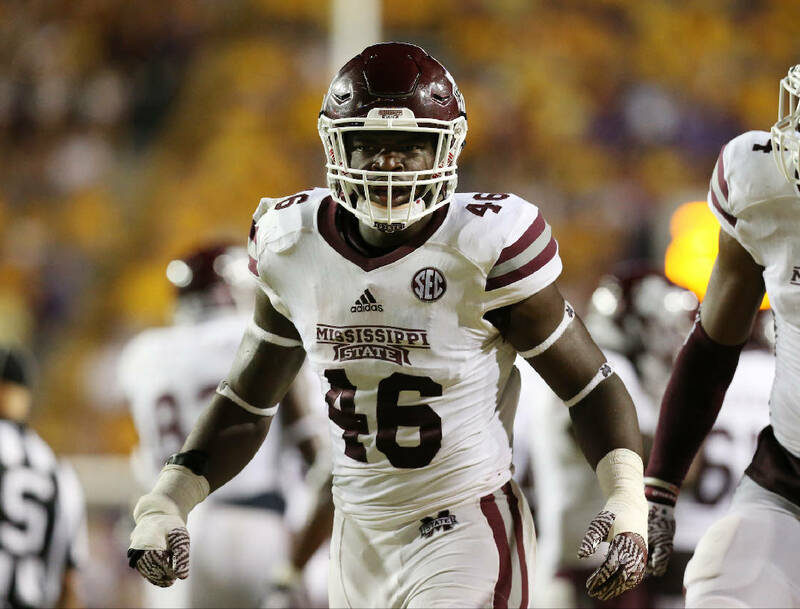 Mississippi State senior middle linebacker Dez Harris has gone through three ACL surgeries during his playing career. › Fun fact: Nick Fitzgerald set SEC single-season records last year for average yards per carry by a quarterback (7.1) and 100-yard rushing games by a quarterback (eight). Mississippi State middle linebacker Dez Harris racked up 37 tackles last season, including 2.5 lost-yardage stops. He appreciates each and every one of them. The 6-foot-4, 243-pound senior from Bessemer, Ala., was among the more unheralded players who traveled to the Southeastern Conference's annual media days event a couple of weeks ago, but he is one of best success stories the league has to offer. Harris, who is expected to be one of the leaders of coordinator Todd Grantham's first defense in Starkville, has endured three anterior cruciate ligament tears. "I've always had my mom and my sister behind me, and that's important to me, because I've never had the desire to give up," Harris said. "When it happened the second time, I knew exactly what to expect. When it happened the third time, I thought I was a pro." His first ACL tear occurred in his right knee while he was at McAdory High School, which produced former Auburn tailback and 1985 Heisman Trophy winner Bo Jackson. Harris was nowhere close to Jackson as far as recruiting stature, with the injury relegating him to three-star status and being his state's No. 33 prospect in the 2013 signing class. Alabama and Auburn did not pursue Harris, and the fact Mississippi State signed him despite the injury is something he will forever cherish. "It meant the world to me," he said. "We've been a family ever since I've been here. You don't turn back on family." After redshirting in 2013, Harris tore his left ACL during the mammoth 2014 showdown against visiting Auburn. In arguably the biggest contest in program history, the No. 3 Bulldogs topped the No. 2 Tigers, 38-23, to vault to No. 1 in the country for the first time ever, but Harris had to celebrate by undergoing the knife again. Harris suffered his third torn ACL and the second in his left knee in 2015. "He has suffered multiple knee injuries during the course of his career, yet he never let any adversity get to him, and he has continued to work and fight through it and develop," Mississippi State ninth-year coach Dan Mullen said. "Here he is as a senior having the opportunity to have a huge year." Said Harris: "They've all been the same as far as getting over." Harris is pumped about Grantham, who he said has brought a fast and physical approach. Grantham was Georgia's defensive coordinator from 2010 to 2013 before spending the past three seasons at Louisville, and Mississippi State is visiting Athens on Sept. 23. "We've already asked Coach Grantham how it's going to feel, and he's excited," Harris said. "We're all excited for him to get back there and show them that we can win." Harris will team with touted sophomore linebacker Leo Lewis on a defense that has six starters back from last season. The Bulldogs have added a pair of defenders who started out at Georgia, defensive end Chauncey Rivers and defensive back Jonathan Abram, though those two did not play for Grantham. Grantham certainly has work to do, with Mississippi State having finished 12th last season among SEC teams in total defense (allowing 459.1 yards per game) and 13th in scoring defense (31.8). The Bulldogs allowed a combined 109 points in consecutive November losses to Alabama and Arkansas. "Anytime you play defense and give up a lot of points like that, it's going to be tough on you and break you down a little bit," Harris said. "We decided to put the past behind us and come out this spring and put our best foot forward." And whether this season includes All-SEC honors or yet another setback, Harris knows he will be leaving quite the legacy of a competitive spirit for those who follow. "I want it to be that I never let anybody or anything hold me down or keep me from doing what I wanted to do," he said. "I've always told my little sister, who just started sports, to stop playing when you want to stop playing. Don't let an injury or anybody stop you from what you want to do."